God is the Maker of everything, and his creation brings him glory by praising Him. When Jesus entered into our world, everything changed. Creation breathed easier, knowing its Maker was nearby. And Satan trembled, knowing his days were numbered. The birth of Jesus, God made flesh, born of Mary, is worth celebrating. It is a wondrous act of God, to reach out to his lost children and reconcile them. The angels sang gloriously, and so must we. The coming of God's Son in the flesh to the town of Bethlehem was the best possible news, and the whole world would benefit. The angels couldn't contain themselves as they told the news, so why should we? Jesus' birth was extraordinary. There was nothing "ho-hum" about it. "On that night, the one True Light, the Son of God was born." Henry Wadsworth Longfellow wrote to a friend, "I do not believe anyone can be perfectly well, who has a brain and a heart." Where did he turn to find hope in his time of despair? The angels tried to convey what their excitement this little baby born in the town of Bethlehem. "To you is born a Savior who is Christ the Lord!" God was up to something - restoring a broken relationship. Here the traditional Anglican service of Christmas is "tweaked" slightly, with prayers following the scripture reading. 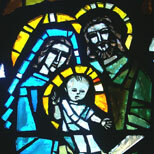 The incarnation of our Lord is told with alternating readings, prayers, and carols. Entitled GOD WITH US, this is a first-person retelling of Luke 1 and 2. Readers for the different characters of the story are needed, but staging and costuming can be kept to a bare minimum. Simplicity can work for you in this case.